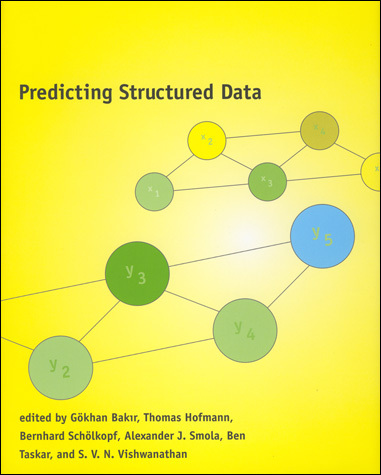 Edited by Gökhan H. Bakir, Thomas Hofmann, Bernhard Schölkopf, Alexander J. Smola, Ben Taskar and S. V. N. Vishwanathan, MIT Press, 2006. Yasemin Altun, Gökhan Bakir, Olivier Bousquet, Sumit Chopra, Corinna Cortes, Hal Daume III, Ofer Dekel, Zoubin Ghahramani, Raia Hadsell, Thomas Hofmann, Fu Jie Huang, Yann LeCun, Tobias Mann, Daniel Marcu, David McAllester, Mehryar Mohri, William Stafford Noble, Fernando Perez-Cruz, Massimiliano Pontil, Marc'Aurelio Ranzato, Juho Rousu, Craig Saunders, Bernhard Schölkopf, Matthias W. Seeger, Shai Shalev-Shwartz, John Shawe-Taylor, Yoram Singer, Alexander J. Smola, Sandor Szedmak, Ben Taskar, Ioannis Tsochantaridis, S. V. N. Vishwanathan, and Jason Weston. Edited by Shahar Mendelson and Alexander J. Smola, Springer Verlag, LNCS 2600, 2003. This book contains a collection of the main talks held at the Machine Learning Sumer School at the Australian National University on February 11-22, 2002. It contains tutorial chapters on topics such as Boosting, Data Mining, Kernel Methods, Logic, Reinforcement Learning, and Statistical Learning Theory. The papers provide an in-depth overview of these exciting new areas, contain a large set of references, and thereby provide the interested reader with further information to start or to pursue his own research in these directions. Peter Bartlett, Markus Hegland, John Lloyd, Jyrki Kivinen, Gunnar Rätsch, Ron Meir, Shahar Mendelson, Bernhard Schölkopf and Alexander Smola. Bernhard Schölkopf and Alexander J. Smola, MIT Press, 2002. In the 1990s, a new type of learning algorithm was developed, based on results from statistical learning theory: the Support Vector Machine (SVM). This gave rise to a new class of theoretically elegant learning machines that use a central concept of SVMs - kernels - for a number of learning tasks. Kernel machines provide a modular framework that can be adapted to different tasks and domains by the choice of the kernel function and the base algorithm. They are replacing neural networks in a variety of fields, including engineering, information retrieval, and bioinformatics. 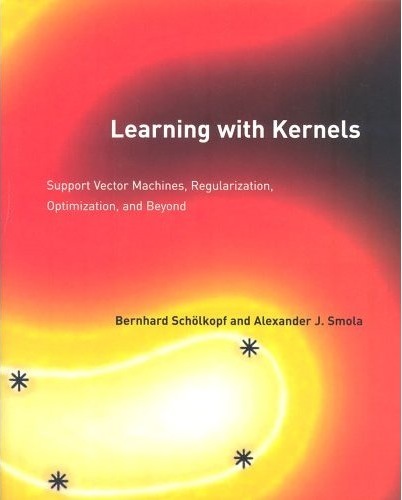 Learning with Kernels provides an introduction to SVMs and related kernel methods. Although the book begins with the basics, it also includes the latest research. 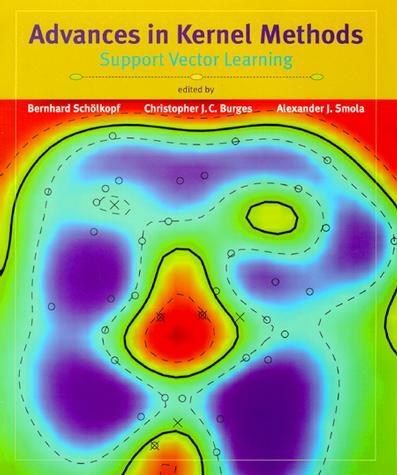 It provides all of the concepts necessary to enable a reader equipped with some basic mathematical knowledge to enter the world of machine learning using theoretically well-founded yet easy-to-use kernel algorithms and to understand and apply the powerful algorithms that have been developed over the last few years. Edited by Peter J. Bartlett, Bernhard Schölkopf, Dale Schuurmans, and Alexander J. Smola, MIT Press, 2001. 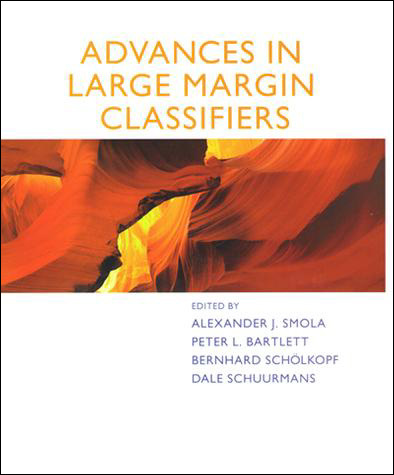 The concept of large margins is a unifying principle for the analysis of many different approaches to the classification of data from examples, including boosting, mathematical programming, neural networks, and support vector machines. The fact that it is the margin, or confidence level, of a classification--that is, a scale parameter--rather than a raw training error that matters has become a key tool for dealing with classifiers. This book shows how this idea applies to both the theoretical analysis and the design of algorithms. Olivier Chapelle, Nello Cristianini, Rainer Dietrich, Andre Elisseeff, Theodoros Evgeniou, Thore Graepel, Isabelle Guyon, Ralf Herbrich, Adam Kowalcyzk, Yi Lin, Olvi Mangasarian, Mario Marchand, Klaus Obermayer, Nuria Oliver, Manfred Opper, Tomaso Poggio, Massimiliano Pontil, Pal Rujan, Bernhard Schölkopf, John Shawe-Taylor, Alex Smola, Haim Sompolinsky, David Stork, Grace Wahba, Chris Watkins, Jason Weston, Robert Williamson, Ole Winther, Vladimir Vapnik, Hao Zhang. Edited by Chris Burges, Bernhard Schölkopf and Alexander J. Smola, MIT Press, 1998. The Support Vector Machine is a powerful new learning algorithm for solving a variety of learning and function estimation problems, such as pattern recognition, regression estimation, and operator inversion. The impetus for this collection was a workshop on Support Vector Machines held at the 1997 NIPS conference. Peter Bartlett, Kristin P. Bennett, Christopher J. C. Burges, Nello Cristianini, Alex Gammerman, Federico Girosi, Simon Haykin, Thorsten Joachims, Linda Kaufman, Jens Kohlmorgen, Ulrich Kressel, Davide Mattera, Klaus-Robert Müller, Manfred Opper, Edgar E. Osuna, John C. Platt, Gunnar Rätsch, Bernhard Schölkopf, John Shawe-Taylor, Alexander J. Smola, Mark O. Stitson, Vladimir Vapnik, Volodya Vovk, Grace Wahba, Chris Watkins, Jason Weston, Robert C. Williamson.